Offers extra weather protection for smaller Zephyros and Laser models. This tarp is designed to fit the Zephyros 1 and 2, Zephyros Lite 1 and 2, Laser Competition 1 and 2, Laser Photon 1 and 2. 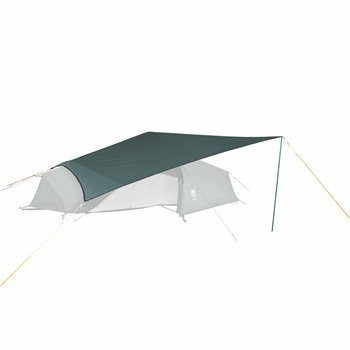 The tarp offers extra weather protected storage or cooking space and ventilation options. The amount of covered space can can be adjusted by altering the position of the tarp over the tent. It is made from the same tried and tested Wild Country high performance flysheet fabric used on Zephyros models. The amount of porch space can can be adjusted by altering the position of the tarp over the tent. Comes with one pole and 4 guylines.